A multi-award winner, NIVEA Invisible for Black & White Pure Aerosol Spray Deodorant, has most recently been voted as the Best Deodorant by consumers*. This deodorant can be used to keep your black clothes black, and white clothes white for longer. 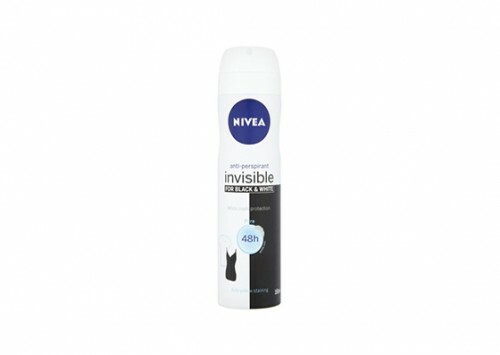 Keep your black clothes black and white clothes white for longer with NIVEA Deodorant INVISIBLE FOR BLACK & WHITE PURE. The first and best antiperspirant deodorant that protects against yellow sweat stains on white and white marks on black clothes. NIVEA Deodorant Invisible for Black & White protects you and your favourite clothes, so blacks stay black and whites stay white for longer. The smell of this smells so fresh and clean but unfortunately, it didn't do a good job. Upon spraying under my arms, it created a powdery white mess, all over my clothes and skin. Not ideal! It also didn't do much to help with keeping me fresh. I thought that I had maybe not shaken the bottle enough but the mess kept occurring. Would not recommend! I used the full bottle of this more out of laziness to go to the supermarket to get another one. I found it didn’t combat the b/o smell very well. It smelt great after first applying but after any physical activity it wears off quickly. Even without physical activity it only lasted me a few hours. No white marks however so it does do as it says, perhaps it just wasn’t suited to me. I used this once when the one I wanted was sold out. The Nivea one was the next best thing because I wanted a stain free deodorant. It was close to the price of the other one I wanted, so it was still affordable. It had a light, pleasant scent and wasn't overpowering. It was also easy to carry around in the bag. I sprayed it on after I had a shower, focusing on my underarms. It was gentle on the skin, but it left white marks on my clothes, which was annoying. It also didn't keep me from sweating for long periods of time. I was pretty disappointed with this spray, I felt like I wasted my money on it. I will never use this again. It doesn't really do what it says. Tips: Use it after showers. So I was previously using an Avon brand underarm that did not leave white marks on my dark clothing and while this did a decent enough job as a deodorant and an ok job with stopping the marks I switched to this one and have found that it does do a better job at stopping the white marks however it is not all that great as a deodorant and doesn't last 48 hours. I generally use aluminium-free deodorant (which doesn't stain white clothes!) but for summer I need an actual anti-perspirant. I love the fresh floral smell of this, and the fact that you can lock the aerosol closed which is handy when traveling. I haven't noticed white marks on my black clothing, but alas. There are white stains on my white shirts! It looks like a build up of white residue...? I suppose it's better than yellow stains, but I was still unimpressed. I've gone through two lots of this deo, but next summer I'll look out for a new option. I also found that the anti-perspirant element only lasted the morning. By lunchtime I was sweating up a storm. Super gross. The deodorant sprays on nicely and drys down pretty quickly. On black and white clothing it didn’t leave stains whatsoever which was nice but the antiperspirant side of the deodorant didn’t work the way I needed it to. It maybe lasted a couple hours at most in a not so active environment so I can’t imagine how it would perform with an active job. Definitely don’t recommend unless you want to keep reapplying every couple hours. I brought this product after seeing it advertised on TV and hearing so many raving about it. It comes in a simple spray on deodorant. I often were white tops and my uniform for work is white and I have experienced the horrible yellow stain marks that other deodorant have caused and ruined my clothes. I was impressed that this didn’t leave any yellow marks and left my tops nice and white under the arms. As a deodorant, it isn’t that effective. It’s isnt long lasting and doesn’t reduce swearing. I found that after shaving my underarms and using this deodorant the next day, it would sting and irritate my skin. Finally! A deodorant that doesn't leave white marks on my black tops! This really works. I have never had marks on my tops using this deodorant and have been using it for several years. Before I found this deodorant, I was constantly dealing with marks. The smell is pleasant and not overwhelming. The applicator works well to apply the perfect amount of deodorant. This deodorant keeps me dry and not smelly for the whole day. If I do vigorous exercise though, I often need to reapply. The skin under my arms is quite sensitive and many deodorants irritate it, however, this one doesn't. I do find that my underarms get a bit dry sometimes, but a quick application of body moisturiser fixes that. This is my every day go to deodorant. It works. Plain and simple. It has your usual deodorant scent, and it isn't too strong or overpowering. It sprays wide and well. I dont feel sweaty throughout the day and it doesnt leave any marks on my clothes. It does everything it promises!! Highly recommend. In many ways this product does what it claims if you're considering its claims to not mark black or white clothing. However for me it failed to effectively act as an antiperspirant for more than an hour or two before needing to be reapplied. So it's either going to end up being something I would only use to protect a special occasion outfit I'll be changing out of in a couple of hours or a very expensive daily use choice (because I'll need to buy a lot of it to keep reapplying). I guess the only way to know if it will be effective for your daily needs is to buy it (on special) and try it. But if you are heading out to play sports or for a higher stress situation (special first date or job interview, etc) I wouldn't suggest relying on this.